The second expansion for Pillars of Eternity, a classical cRPG . 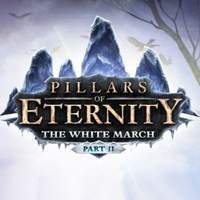 The DLC continues the story started in The White March – Part I, expanding the game world with new locations and quests. The add-on also increases the character level cap and adds some previously unavailable special abilities. It introduces an additional companion, a barbarian named Meleha, as well as the Story Time mode which accelerates story progress. The plot was written by the co-creators of the original game’s story: Eric Fenstermaker (also known for his work on South Park: The Stick of Truth) and Carrie Patel, the author of a popular steampunk novel series, Recolleta.